WIP Wednesday in KatersAcres Polyclay Studio: Canes! 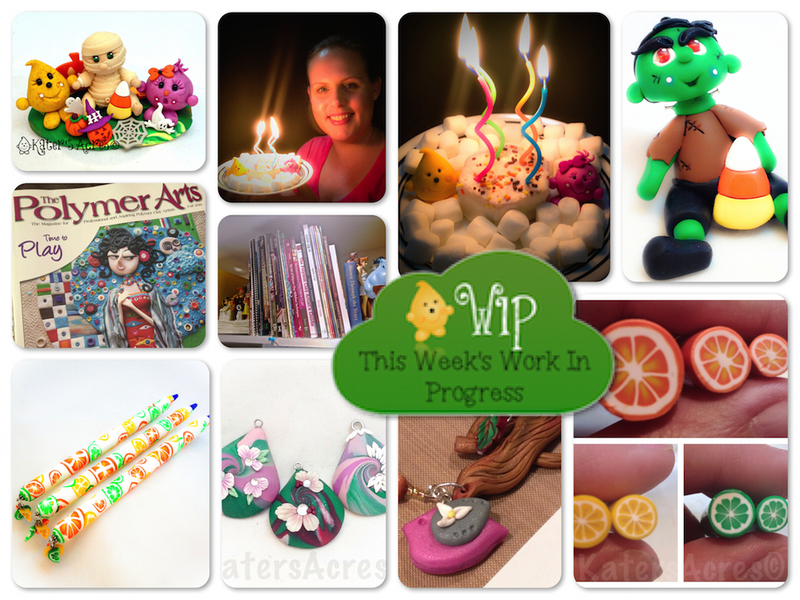 This has been a very busy week … so busy, my WIP Wednesday post is being published on Thursday. This is kind of sad for me because this is the first WIP Wednesday I’ve missed since last December. But … let’s move on and talk about all that’s going on in the montage above. Parker & Lolly Meet a Mummy! Yep … you know it was bound to happen … Parker & Lolly found a Mummy in the attic and wait until you see how cute he is … and he glow in the dark. He’s in need of a new home, so you can adopt him here. Parker turned 4! Yep, it’s hard to believe, but Parker is four. Lolly came to his birthday party last night and a little elf named Debbie made his cake. “Frank” Halloween Tutorial: Parker’s Clayful Tutorial Club received this tutorial for their first tutorial of the month. Some of them are already hard at work making “Frank” to put in their Etsy stores. Club members pay only $9.95 a month, this tutorial alone is $12. Become a member and save on tutorials. Citrus Canes: I am so behind on my 52 Weeks of Canes, but for some reason, citrus was just screaming to me this past week (perhaps because I have been craving oranges). So not only did I make canes, but I made myself some citrus pens too. Fun huh? Upcoming Project: I am working on a upcoming free video tutorial, it features some of these cute elements here. Scrappy Pendants: Many people collect scraps for use as beads cores, etc. But when I make canes, because I make custom palettes for most of them, the match beautifully. So rather than making Stroppel Canes or chucking the ends into a bin, I love to make little pendants that I put on chains & sell at craft shows at a minimal cost … after all, they were just scraps! Citrus Caned Pens: Many of you asked questions as to how I added the dangles & what size dangles they were in the 52 Week of Canes Cafe. I used headpins that I cut down to size, covered the ends with Bake & Bond, then just stuck them into the top of the pen. The dangles I made separately and baked with the pins in. I then assembled them post baking. The newest issue of The Polymer Arts magazine arrived this week. Now to find the time to sit down & read it! I organized my polymer clay books that sit directly in front of me (well slightly above my head) while I clay. These include some of my favorite &/or most used books for inspiration. Full post on this coming in the future. This week, I have been inspired by artist Lisa Ammerman from “A Piece of Lisa.” She creates doll-like sculptures from polymer clay. She’s getting ready to do a big show & has featured some of her newest works as she prepares for that show. Check out her post featuring some of these creations here. I’m inspired by Lisa originality. All of her dolls have spindly legs, large bodies, and smallish heads. Her style is recognizable instantaneously. This color palette seems to match seamlessly throughout all her seasonal projects. What a fantastic artist.